It’s been hard to avoid reading about ‘Deadpool’ recently, such has been the relentless barrage of material across all forms of media courtesy of the film’s marketing department. Despite coming from Marvel (although produced by Fox Studios), the film has been pitched as a subversive, anti comic book movie with an R rating and a markedly different tone from the family friendly nature of most of Marvel’s recent output (and even the superior ‘X-Men’ series, also from Fox, to an extent). So can ‘Deadpool’ live up to the anticipation and lofty expectations? Resoundingly so. This is a riotously funny, dirty, vulgar comic book movie and it’s an absolute blast. From the opening credits right through to the end, this is an entertaining rollercoaster ride and I enjoyed it immensely. There are a lot of things ‘Deadpool’ does well but it’s hard not to start with Ryan Reynolds. Reynolds is a talented actor, capable of shining in both comedic and dramatic roles, but for whatever reason a series of good roles have proved mostly elusive. Reprising his role as ‘merc with a mouth’ Wade Wilson after a turn in ‘X-Men Origins: Wolverine’ provides him with an excellent one and he relishes it with a hilarious, energetic display. Frequently breaking the fourth wall leads to numerous funny moments and at times it feels as if the dialogue is partly improvised, particularly when Reynolds is riffing with T.J. Miller (who is excellent in HBO’s ‘Silicon Valley‘) as his best friend Weasel. This is a film all about Reynolds and it shows in a mostly sidelined supporting cast, who are solid but unspectacular. Morena Baccarin makes for a good love interest, whilst the likes of Gina Carano (Angel Dust) and Stefan Kapicic/Andre Tricoteux (Colossus) were cast for their physicality more than their acting chops. Ed Skrein features as Ajax, or the ‘British Villain’ and his performance is fine with a fairly one note character. 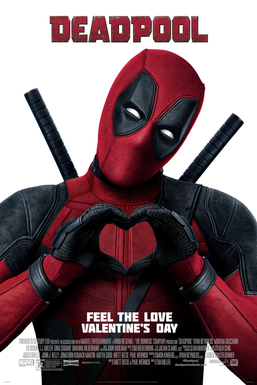 ‘Deadpool’ is littered with cultural references, both mainstream and obscure, and it was great fun in a packed cinema spotting the one’s people did and didn’t get. Reynolds is also not above poking fun at himself, with several references at his failed turn as ‘Green Lantern’ a few years ago and several other comments that break the barrier between illusion and reality. The narrative is structured in a way that fits perfectly for the fast paced direction as we jump back and forward in time to explain how Wade Wilson became ‘Deadpool’, without the film feeling like a traditional superhero origin story (of which we’ve seen a lot of recently). This is a comic book adaptation but for the most part it eschews tropes of the genre and in many cases openly mocks it, with one fight towards the end with Ajax perhaps being the exception. The best thing about ‘Deadpool’ is how fresh and energetic it feels in a genre that’s felt oversaturated to the point of boredom in many recent cases (‘Avengers: Age of Ultron’ I’m looking at you in particular). Not everything hits, and it’s not always as smart as the script thinks it is as it occasionally hits many of the beats it’s trying to subvert, but for the most part this is terrific, hilarious fun and I was thoroughly entertained!